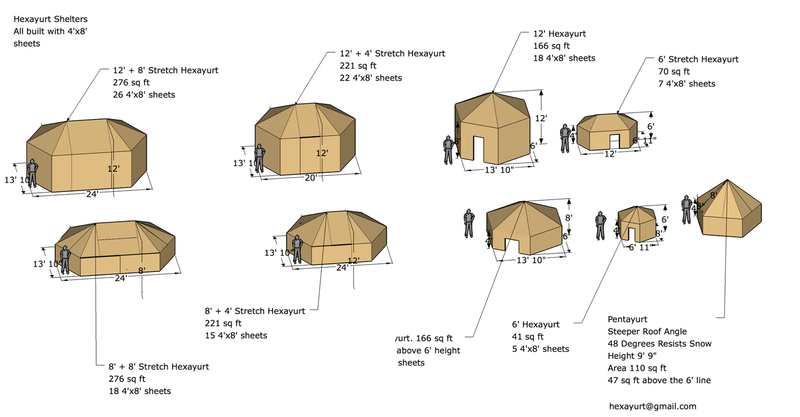 This research examines a hexayurt made from plywood, OSB or a similar wood product for use in crisis housing situations. It builds on existing work at Technical University of Eindhoven on carton hexayurts, under the guidance of Arno Pronk. The plywood hexayurt is interesting because it uses materials which are standard in the global building industry supply chain. It requires only a straight few cuts with a saw to manufacture, and a screw gun to assemble. The design produces practically zero waste. This makes it very likely that the design can be spread worldwide to areas which have frequent needs for emergency shelter. Local construction workers or first responders may do the majority of shelter construction. There are two basic geometries for the plywood hexayurt. There are many other possible construction variants, many of which may be worth investigating. Page was last modified 03:43, 15 April 2011. Based on work by LucasG, Chriswaterguy's bot and Vinay Gupta.